Midlife crisis movies are a dime a dozen. Lee Kirk (director of The Giant Mechanical Man) takes at stab at the genre hoping to breathe some life into it by casting Green Day frontman Billie Joe Armstrong and making it about a former punk rocker. Yet it gets so tied down attempting to hit all the familiar story beats that it never becomes anything but just another ordinary midlife crisis movie. After an opening credits scene in which we see Perry playing a concert at what is supposedly the height of his musical career, the film flashes forward 20 years later. Now he has settled down into domestic life with his wife and two kids. When he isn’t accidentally teaching his daughter bad language or forgetting to change the baby’s diaper, he’s stealing little moments to practice playing his guitar. For just a brief moment the sound transports him back to the stage where he and his band belted out their punk rock tunes to a full house. Yet inevitably his screaming kids bring him back into his now ordinary world because it’s time to take them to school and head off to his boring day job. On the way to school his daughter asks him what she should say about him for career day. He claims his band is on hiatus, but she doesn’t buy it. Then he heads into work at the family run hardware store where he has to listen to complaints from his brother (Chris Messina) about his poor work ethic and knowledge of the store and its products. However, when Perry reminds his brother that it’s his birthday, he gives Perry a thousand dollars and the day off to blow off some steam. Of course, Perry quickly takes him up on the offer, checking into the Presidential suite of an expensive hotel. He calls his former band mates hoping for one last hurrah reminiscent of the good ol' days, but once they arrive to try to kick start the party, Perry can't seem to let go of his domestic concerns. The cast here is a veritable who's who of recognizable faces from the worlds of television and indie filmmaking. Selma Blair plays Perry's loving, but disappointed wife. Her parents, played by John Doman and Mia Dillon, show up to look down on Perry and make him feel inadequate. Chris Messina plays the much harder working brother trying to kick Perry out of their family business. Fred Armisen, Lucas Papaelias, Dallas Roberts, and Kevin Corrigan play friends and former band mates, who are still angry Perry left the band in favor of settling down with a family. Sean Gunn and Valentine Miele play acquaintances from the cul-de-sac hoping Perry will finally join their group of fathers in the neighborhood for some evening poker games. Brian Baumgartner (from The Office) plays the uptight hotel manager ready to pounce on Perry if there are any damages to the expensive room he's staying in. And finally Judy Greer is on hand as Perry's old flame. She also happens to be a music manager who may be willing to give Perry's music another shot. To his credit, Armstrong plays the wistful Perry with a likable charm even if he doesn't sell every moment. It's clear he misses the band and domestic life doesn't quite suit him, but Armstrong gives the character an aloofness that keeps him from coming across as the standard issue indie movie sadsack. More often than not, my qualms with Ordinary World were with the writing and direction rather than any of the performances. Writer/director Lee Kirk’s work here is uninspiring at best. 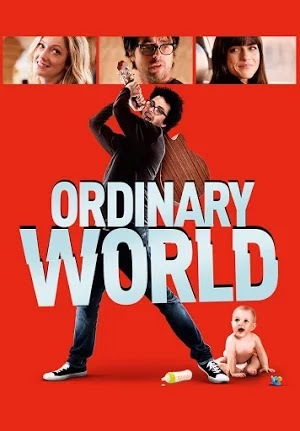 Despite its "party" scenes (some of the tamest party scenes ever put on film), Ordinary World never becomes a wild raucous journey, nor does it become an introspective character study. Rather it becomes a stereotypical midlife crisis film that hits too many of the familiar genre tropes including an eventual choice between family and career revival - two things these sorts of films continue to be convinced are mutually exclusive. We’ve seen this story play out many times, and there are no surprises here. There are also too many side characters and subplots, most of which Kirk manages to make feel forced and unnecessary. Worse yet, the final act relies on a deus ex machina in which people randomly show up to solve his problems for him or agree to let things go after a shrug and an apology. At one point Perry is even made to take a break from the party to look at himself in a mirror while stating his subtext out loud. Star power can't fix bad writing. It isn't just that this film is predictable, for a comedy it isn’t funny and for a drama it isn't dramatic. It's a shame, because this film seems like a personal one for Armstrong. He is an aging rocker likely looking toward the next phase in life. If Ordinary World proves anything, it's that Armstrong may just have an acting career waiting for him. For his sake, I hope his next project isn't so ordinary.